For many families, the kitchen is the most important room in the house. It’s a room that needs to fulfil many functions and not taking the time to thoroughly plan your new kitchen, could be a costly mistake. 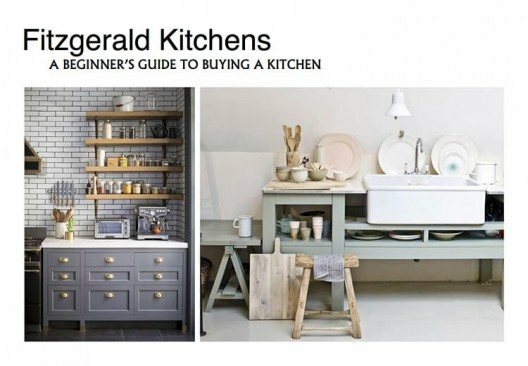 This guide will show you what to keep in mind when planning your first kitchen. Planning your new kitchen is a big endeavour with many choices and decisions to be made. But that’s exactly why we’ve put together this guide: to help you through this process with as little hassle as possible. Get a notebook or a scrapbook to collect your ideas. Collect sample of finishes and colours that you like. Take photos of other kitchens and keep them in a reference file on your computer. Set up an account on Pinterest and use it to collect your ideas and get inspiration from other people as well. Don’t have time to read the beginners guide right now? Is it a social space or a functional space only? Does the whole family use the room? Will you eat in the kitchen as well as cook? How much seating do you need? What is your family set-up? Do you have young kids or family members with special needs? Are low maintenance finishes a priority? The kitchen of a single person who eats out regularly will look completely different from one belonging to a family who eats their evening meals together. How much storage space will you need for your groceries, cutlery and crockery? Which appliances would you want to accommodate? Is it a lack of workspace, or maybe poor layout? Google “kitchen ideas”, “kitchen trends” and “kitchen design” and see what you find. Look through the online versions of your favourite design magazines. Ask what your friends and family like and dislike most about their kitchens. Have a look at the kitchen section on Houzz for ideas. Search for “kitchen design ideas”, “kitchen inspiration” and “kitchens” on Pinterest. Have a look at our inspiring Kitchen Design Ideas Centre or our award winning blog. Check out our 101 Kitchen Design Ideas post. Are you happy with the location of appliances in your kitchen? Are your appliances the right height for you? And are they the right size for your needs? Consider additional features: do you want an island unit or a breakfast bar? To test if your ideas will work, it is important to put pen to paper. Measure the space available for your new kitchen and mock up the room using graph paper. This will give you an accurate representation of the kitchen units and furniture. Playing around with a layout is also a great way to improve the efficiency of your kitchen. 4. Do You Have A Dining Room ? … and do you use it? The dining room has become a casualty of modern living, with many of us far happier to congregate in a large kitchen to cook, eat, talk, and watch television. Unless you hold regular formal dinner parties or will use your separate dining room for other activities, such as a music room or study, it may make sense to dispense with it altogether and use the space to expand your multi-purpose kitchen. A scullery is certainly a luxury in modern homes But if it is at all possible, create a separate scullery for washing up, laundry and keeping dirty dishes out of sight. It could also be a useful space to store some lesser-used appliances. 5. What Is Your Budget ? A new kitchen can cost anywhere from a couple of thousand to tens of thousands of Euro, so decide on the look you want and then think about ways to trim back. A rule of thumb is never to spend more than 10% of the value of your home on renovating your kitchen. Decide your budget from the outset and try not to be swayed by glossy advertising or smooth salespeople. Check out this how much value a kitchen can add to your home. 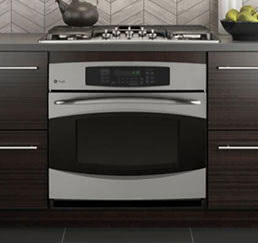 What kind of appliances are you going to have installed? Choose the best brand that you can afford and remember to incorporate this into your overall budget. 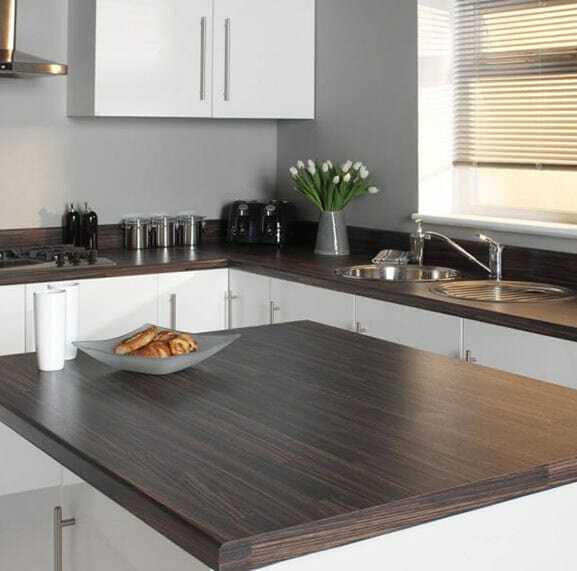 Laminate worktops are standard and are usually included in the manufacturer’s quote. Granite and wood almost always cost extra and can dramatically add to the final cost of the project. Check if your supplier has included this in their cost. Or, if you are arranging this separately, make sure that all the extras like insurance, rubble removal and all materials are included. What is the cost of wiring any new appliances or lighting? Do any sockets have to be moved? Do you have to buy new electrical fixtures? What are the cost of the tiles themselves and the tiler’s fee? What is the cost of installing a new sink and other appliances like a dishwasher that require plumbing? Are you going to use a gas hob and cooker? If so, they will also need to be considered as this cost is not usually included in the kitchen manufacturer’s costs. If you are going to install the kitchen yourself, is delivery included in the price? Will there be extra charges if your home is difficult to access? How much re-painting will be required? How much will it cost? Are you going to manage all these items yourself? You will save a lot of money but be prepared or a large amount of time spent in chasing up quotations, following up with contractors, scheduling the work, making sure the work is done to the correct standard, payment, and dealing with challenges. It is impossible to plan for everything. Allow 5% on top of your total cost for unforeseen items. Perhaps the biggest deciding factor in your kitchen design will be the size and shape of the room. You can only work with the space you have available, so it is important for you to identify what type of kitchen you have and consider how best to design it. The main types of kitchen layouts are: single-wall, gallery, L- shaped, U-shaped and L-shaped with an island. The working triangle is a useful guide. Plan the activity areas of cooker/hob, fridge and sink in a triangle spanning a total of between 4 and 7.9m for the perfect working kitchen. You can find out more by reading our blog post What is the Kitchen Work Triangle? Avoid placing the fridge next to the oven as the heat from the oven may reduce the efficiency of the fridge. If you have a small or narrow space, a single wall kitchen is a great solution. Rather than cluttering the kitchen with many wall-mounted units, it makes the most of the height of the room with tall cupboards and floor units. Galley kitchens provide a practical solution and offer more storage below the worktops. 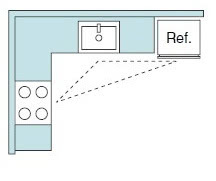 The most important consideration is to leave at least 90cm between the two rows of units so that you can bend over to reach inside the oven without bumping into the cupboards behind. A U-shaped design will provide plenty of work surface and storage space. It can however, become a little enclosed if there are cabinets all around the room. 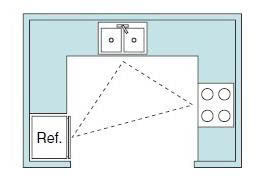 If this layout is chosen for a bigger room, one of the legs of the U may be used as a breakfast bar, or shortened to open up the circulation space. Place the dishwasher and oven in the centre of a section so that they do not obstruct any cabinets when opened. 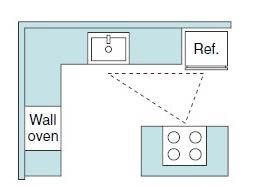 The L-shaped kitchen provides adequate work space and storage below the worktop, while walking distances between the main zones will be minimised. Another big advantage of the L-shaped kitchen is that one section of the room will be free to use as a dining area. Corner cabinets may post a challenge, with solutions including a rotating carousel unit, or a diagonal sink. Islands are hugely popular, providing a free-standing unit with access on all sides. It can accommodate appliances and even the sink and cooker while also creating an informal seating area. If you position your island hob facing into the room you will be able to cook while interacting with your family or guests. Determining the desired look of your kitchen is very important. It should appeal to your style, but also be in keeping with the property as a whole and add value to your house. In-Frame Kitchens (called inset kitchens in the US) is a type of kitchen design where the door of the cabinet is inset within a wooden frame, and the frame is fixed onto the front face of the kitchen carcass. The frame provides strength to the front of a cabinet and is also considered a visual feature. In-Frame Kitchens borrow from traditional cabinet furniture construction and conjures up images of traditional craftsmanship and long-term durability. This style of kitchen has a very utilitarian design that is focused on simplicity and functionality, rather than ornamentation. While the Shakers’ traditional beliefs are central to the design of the Shaker-style kitchen, it has proven to be a timeless style that remains a popular choice today. Thanks to its clean lines and practical layout, it is suitable for both modern and traditional homes. The appeal of painted kitchens is in the balance between style and longevity. The units are pre- assembled in the factory and primed with an undercoat. Once they are fitted on site, they are painted and finished in place. High gloss kitchens offer clean lines, sleek finishes, and striking designs. A modern and mostly minimalist option with a variety of colours to choose from. Wood features heavily in these traditional kitchens, complemented by details like tongue-and-groove panelling, corbels and trims. Colour schemes include whites, creams, and pastel shades to finish the look. This style can also lend itself to a more vintage kitchen. Will your cabinets be factory assembled? Make sure they are factory pre-assembled, as this ensures a top quality product. Do not underestimate how much time, money and hassle will be saved come installation time compared to flat pack cabinets. Will your cabinets be made from board produced by premium suppliers such as Finsa, Medite and Kronospan? but they are not nearly as durable as 18mm boards. Blum, Grass or Hettich. Don’t accept cheap alternatives that could have a reduced lifespan. Are the cornice and pelmet boards included, and what materials are they made of? Can you adjust the height of the shelves? This is especially useful for the wall units. Do the units have solid backs or plywood backs? Are the drawers made of chipboard, are they metal framed, or are the made from solid wood? I sa cutlery insert included? Will your cabinet doors be made from 18mm thick board? Some manufacturers use 15mm thick boards, but these are not the best quality and are not nearly as durable as the 18mm boards. What kind of materials are the doors made of? Solid wood, MDF, or HDF? What kind of door handle options are available? Ask for various colour and finish options. Are the door handles included in the quote? Are high quality hinges being used from a respected brand like Blum or Häfele? 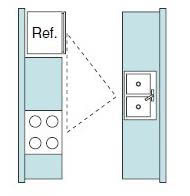 It is especially important to use excellent quality hinges on larger, heavier doors. Otherwise, the doors will start to sag after a few years. 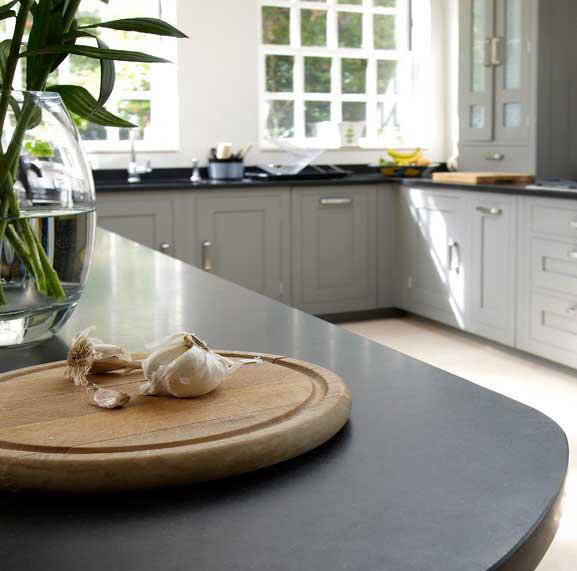 Choosing a kitchen worktop is about more than just the look, it has to be practical as well. There are several different surfaces to choose from, each with its own pros and cons. Granite and marble are favoured for their exceptional durability and beauty, but they are also some of the most expensive worktop options and must be fitted by a specialist. High-Pressure Laminate is suitable for a range of styles and with looks imitating wood, stone and quartz, high-pressured laminate tops are the most cost-effective option. Modern laminates are highly heat and scratch resistant, but care should be taken with very hot pots and pans. 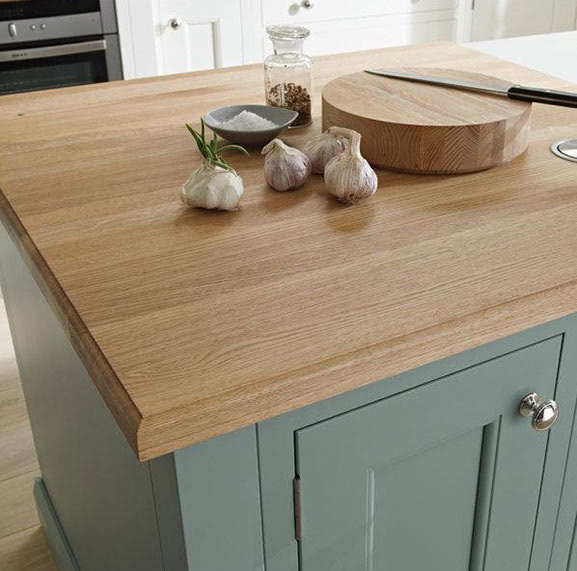 Wooden worktops are beautiful and durable, but do need to be oiled regularly to keep them that way. While not entirely scratch or heat resistant, they can be sanded down and refinished to get rid of burn marks, stains or other damage. Make sure that details like cut-outs for the sink and hob and drainer grooves, as well as any special finishing of the worktops are all included in the quote to avoid getting any surprises with your bill. Make sure that the type and location of joints, if there are any, are all agreed upon prior to installation. There is a wide variety of sinks to choose from. Stainless steel, traditional ceramic, and marble sinks are all great choices. Integrated sinks, another good option, are made from the same material as the worktop in single, double or half bowls with various configurations of drainers. Do you need a large sink bowl? For example, will your sink comfortably accommodate your largest roasting tray? Will the sink come with accessories such as strainer bowls, chopping boards and drainage baskets? Do the taps match your other fixtures? Do you want pull-out taps with a spray fitting? 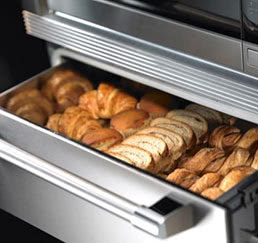 Choosing an oven is not only an important decision; it’s also an investment. These are the most popular kind, and one that most will be familiar with. They heat quickly, evenly and come in various sizes to fit into any kitchen. 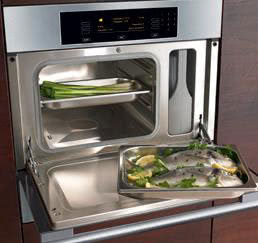 For a healthy option, consider a steam oven. Using water vapours to cook, they’re healthier than a convection oven. It seals in flavour and cooks quickly. It’s also a great choice for baking, as it won’t dry out cakes, biscuits and bread. They will however not be able to brown or crisp, so choose a convection/steam combination. 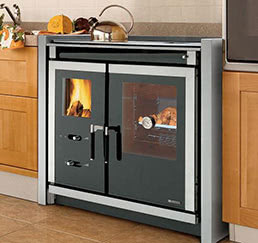 These remain popular as both traditional and range- style ovens. Traditionally, range ovens were used to give heat and hot water for the whole house. A range- style oven on the other hand, looks like a range with separate ovens, grill and hob rings, but works like a normal oven that you switch on as needed. These are heated to lower temperatures than ovens, and are ideal for warming plates, keeping food hot and proofing dough. They can even be used for low temperature cooking, like when making meringues. A beautiful kitchen loses some of its appeal when covered in grease and smelling of last night’s dinner. Kitchen ventilation is required under building regulations and combats the damaging effects of grease and water vapour on the fabric, carpets, and materials in your home. There are two types of hood — extractors and recirculating hoods – both of which can also be integrated. Extractor hoods take air through a grease filter and extract it to the outside via ducting. This removes virtually all steam and cooking odours, while disposable or washable filters trap airborne grease. Recirculating hoods are not as effective as extractors but may be used when ducting out is impractical. Integrated cooker hoods are used in fitted kitchens and blend seamlessly into the design of the room. They are fitted between wall cabinets and concealed with false door fronts. Chimney hoods and hoods over an island are usually the most expensive options, but act as a visual centerpiece to the room. Retractable kitchen extractors are also available which slide out of sight when not in use. Find out how long the kitchen suppliers you are considering, have been in business. Do they have an established showroom where you can view their products? Are they dedicated kitchen experts who specialise in fitted kitchens? through until the kitchen is installed in your home? Will your new kitchen be manufactured in Ireland and support Irish jobs? important if you wish to benefit from the government’s Home Renovation Incentive (HRI). Do you have friends or family that can recommend the companies you are considering? Measure the space available for your new kitchen and make sure to bring the measurements with you to the showroom. Do your research. This will allow you to be in a much better position to leverage the kitchen designer’s experience and judge their expertise. Write out a list of questions and bring them with you to the showroom. And then most importantly: enjoy the process! Planning a kitchen and seeing the results of your imagination, hard work and inspiration come together in a design that you helped to craft is a hugely rewarding process. We wish you the best of luck with your new kitchen and hope it will bring you many years of joy. Or contact us here to book your FREE design appointment.